After the first trials were conducted in September, the team now has only 18 players down from the 26 players that were selected from the Our Telekom National Beach Soccer Championship in April. According to Team Manager, Reuben Oimae, the 18-man training squad will be further trimmed to the final 12 plus 3 non-travelling for the final squad of 15 players. The final cut will be conducted during the second Bilikiki Challenge championship which the Solomon Islands Football Federation (SIFF) will be organising at the end of the month. At this stage the training squad is maintaining its tri-weekly training sessions held at DC Park on Mondays, Wednesdays and Fridays starting from 4:00pm till 6:00pm. The team is working on the fitness level of the players, ball handling skills and set pieces. Oimae said that the team management is happy with the commitment of the players to their training and the quality brought to the side by the new players. “The new players we have selected have upped the benchmark for our old players regarding their commitment and work rate at each training session,” Oimae said. Currently, the team is training under the leadership of Head Coach, Henry Koto who is being assisted by defender Gideon Omokirio. 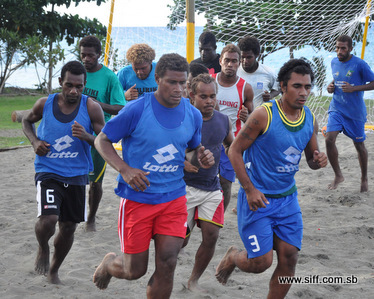 The Oceania Football Confederation (OFC) Beach Soccer Championship will be held in Tahiti in February 2011. The winner of the OFC Beach Soccer Championship will represent Oceania at the 2011 FIFA Beach Soccer World Cup in Rome, Italy. Bilikiki has attended the last 4 FIFA Beach Soccer World Cup championships starting from Rio de Janeiro in 2006 and finishing with Dubai in 2009. Bilikiki is ranked 14th in the world.